Backyard train toy railroad project plans and video. 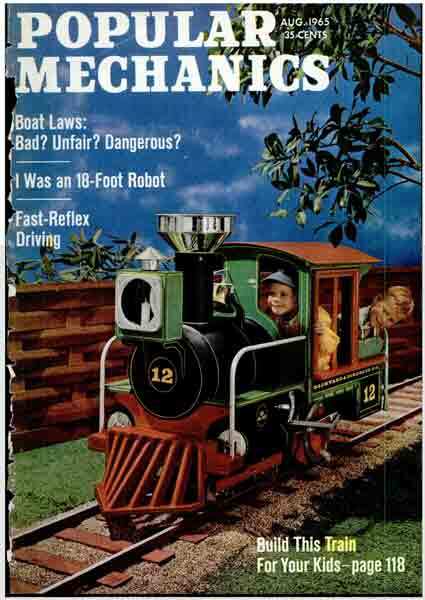 This is a backyard train in the August 1965 edition of Popular Mechanics. The toy train is designed and built by Robert Woolson, who works as a Chicago TV advertising man and makes toys in his spare time. What makes this riding toy unique is its method of propulsion. Today we would expect a toy of this nature to be driven by a battery powered electric motor. In fact, this riding toy train is propelled by magnetic power in the form of a pair of battery powered solenoid pistons. Just like a pair of steam powered pistons, but instead of using steam to drive the pistons, this engine uses electromagnets. There is a detailed circuit diagram with the plans, if that is the way you would decide to go. Personally, I would love to make one. If I decided to try the solenoid piston driving mechanism, I think it would be wise to make a scaled down prototype first to see how it would work: I have no doubt it would. I have seen many a solenoid motor on YouTube, even one made from paper clips. They tend to run really fast for some reason that may be obvious, perhaps because they are not governed, if that’s the right world. Here is part 1 showing how the 14 foot backyard train toy was made. instead of using the propulsion system as described in the article, kmills440 used a wheelchair motor instead, which strikes me as a far more practical choice. Download a copy of the article on how to build this toy train. If you decide to make one, there is some help in choosing the motor and calculating the gear reduction ratio.